Poland Syndrome treatment using finger braces is quite new to us at PIP-UK. We spoke to Crystal on Facebook recently as she shared some information about using finger braces as a therapy for Poland Syndrome. We were intrigued to find out more and ask Crystal if she would write to us about her therapy. This is what she sent back to us. Finding answers regarding my chronic pain has been no different. As a result, I have had to conduct extensive research of my chronic pain symptoms, on my own. A few months ago, I received a new possible lead from a friend. 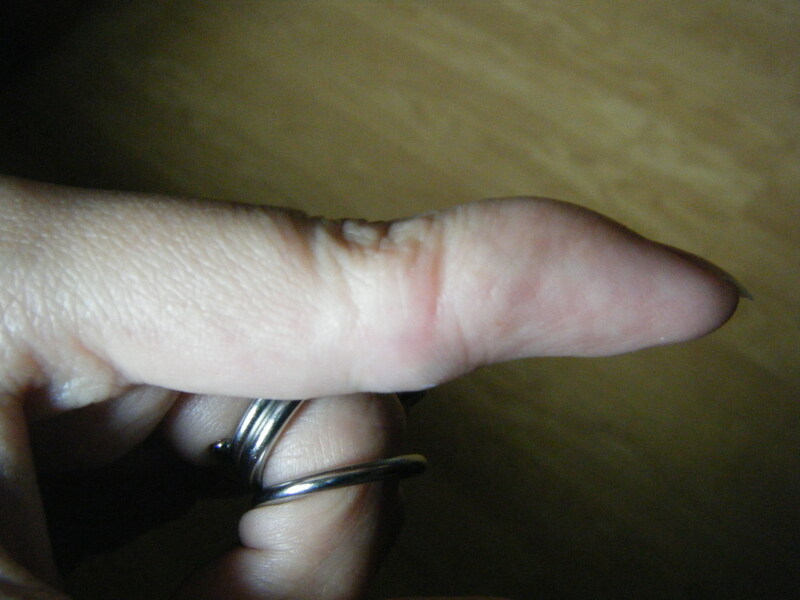 When researching the condition, I discovered “swan neck deformity” as one of the symptoms. I found that several of my fingers showed this phenomenon, which afflicted my Poland Syndrome fingers most predominantly. I began to research possible treatments for swan neck deformity, to either reverse or slow down the damage to the tendons in my fingers and discovered the tri-point finger braces. After I had corrective surgery on my hand shortly after my Poland Syndrome diagnosis (fixing the webbing and trying to straighten my middle finger), little attention was paid to my hand, as lack of knowledge left matters written off as “just a Poland Syndrome thing” and left alone. Never mind that the first knuckle of my index finger can bend backwards to a 90 degree angle, the tendons are so loose! Although the chronic pain diagnosis turned out to be a dead end, I brought the deformity to my doctor’s attention at my next appointment and requested the finger braces (or guidance for what he might have felt to be more appropriate). He referred me to the resident occupational therapist to be fitted for the tri-point finger braces, as I requested. The woman took measurements of the angle of hyperextension* (for her own records, I suspect) as well as the circumference of my fingers, for determining the size of braces to order. My insurance only paid for one set, so we did not want to be careless with the price of almost $100 per ring. The OT agreed to order two rings, to start, so I could try these and see if I wanted to use this type or try a different model or sizes before ordering the rest (as there are no half-sizes). I had hoped for the non-coil design (to improve function, for reasons I will detail shortly), but the facility did not have the $300 sizing kit and was, apparently, unwilling to order it. The sizes for this design are determined based on the circumference of the joint, in correlation to the size chart. The braces look similar to thick, durable midi-rings (rings meant to be worn between the tip of your finger and your first knuckle and are considered quite trendy). 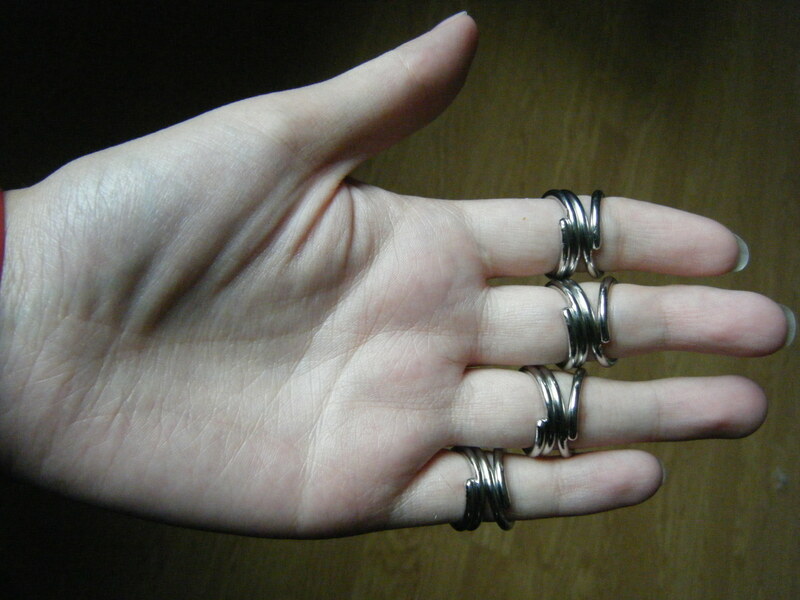 They feel like rings, as well, meaning there are no springs that pull on your fingers in any way. Like a ring, they should be neither loose nor tight. They do not (and should not) hurt, though some finger swelling has made them a little tighter than I prefer. They are meant to prevent my joints from hyperextending while allowing my fingers to function, intended for long-term use. This is compared to a typical splint that would either be large and bulky and hold my finger(s) straight at all times and restrict all movement or flimsy plastic, intended for short-term use (such as an injury). My fingers can still bend in ways they were meant to bend (to grab and hold things), because of this, although not close entirely. 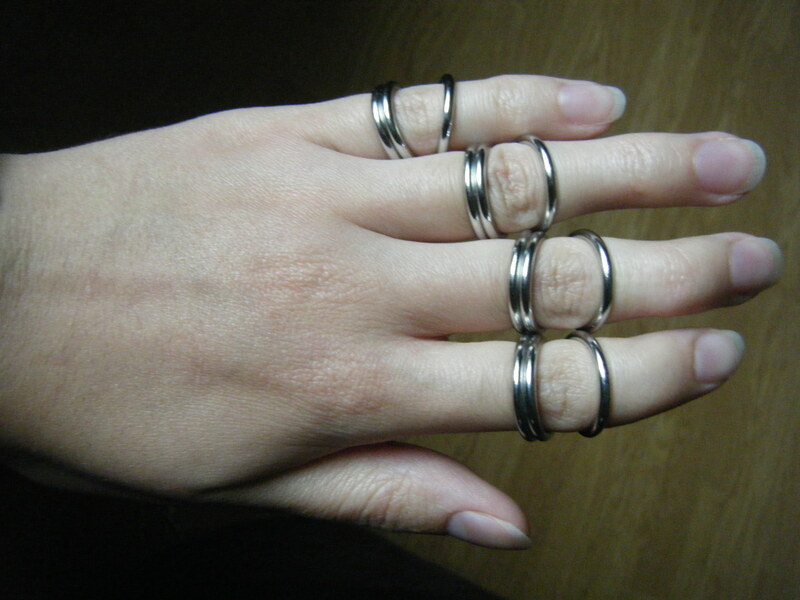 The rings do not interfere with my fine motor skills much; I can still type, eat, and drive normally. Unfortunately, due to the coil-design, they can catch on my hair and are not helpful for washing or styling my hair. This is a significant drawback, to me. 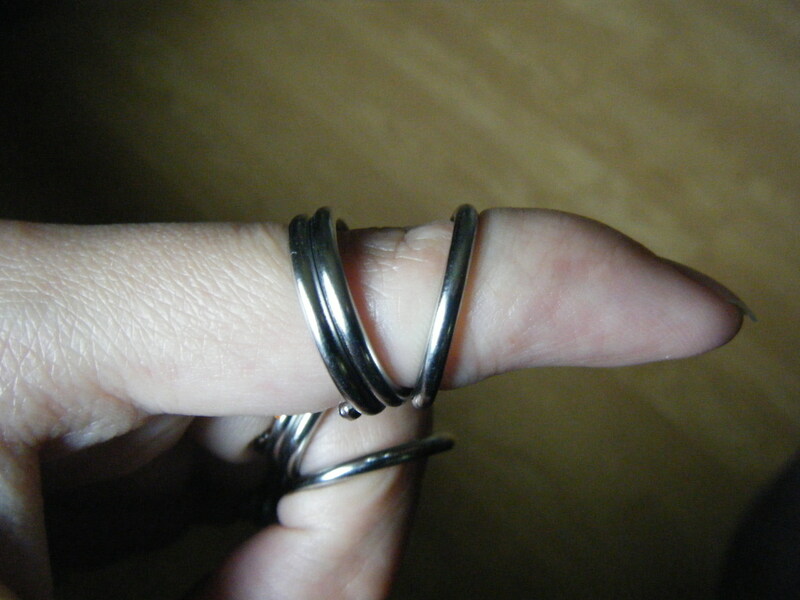 Playing guitar went smoothly, but the rings do hinder my violin-playing (however, my fingers do not typically hyperextend while playing violin, so playing without the rings is not a problem). They simply get in my way, catching on strings and restricting motion. By keeping my fingers from hyperextending, I can prevent and/or slow down the deterioration of my joints, tendons, and ligaments in my fingers. My fingers feel more stable, reducing joint pain while giving me a little peace of mind. Furthermore, if I wear them enough (limiting the amount of time I am not wearing them/allowing the ligaments to stretch), there is a chance those tendons can tighten over time and lessen the amount they are capable of hyperextending — even when I am not wearing the rings! I hope this manages to help someone in their pursuit for improved functionality. Remember to conduct your own research, because you know your body best and are your own best advocate. *The term “hyperextension” refers to a joint which exceeds a healthy range of motion, making the joint unstable and at a greater risk of injury. We are grateful to Crystal for sharing this information about using finger braces for the treatment of one of the symptoms of Poland Syndrome. We think you’ll agree this is a great account and brilliantly written! The images are fantastic too and really give you a sense of what the braces are like. Thank you Crystal. If you would like to share your Poland Syndrome experiences we would love to hear from you. Please drop us an email to pip.charity@gmail.com or you can Tweet us @PIPManchester or leave a message on our Facebook Page. Ask your doctor or occupational therapist if you have one.